The NHL is headed for a record-breaking number of one-goal games this spring with 46, including 25 in overtime, entering Thursday's Game 4 of the Western Conference final between Anaheim and the hometown Nashville Predators (CBC, CBCSports.ca, 8 p.m. ET). 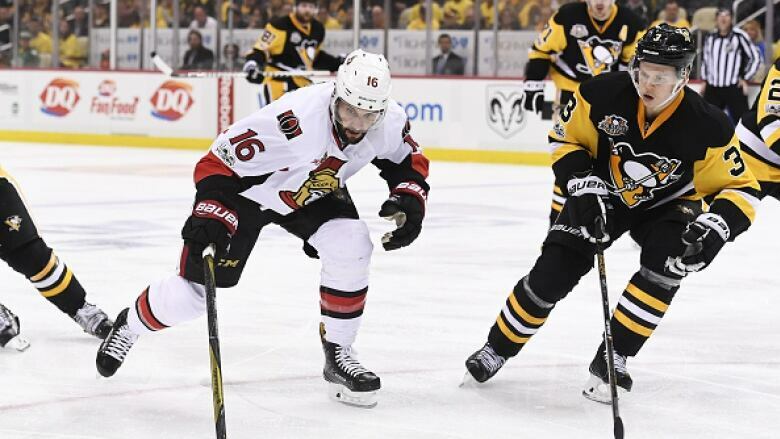 The Ottawa Senators didn't expect to blow out the Pittsburgh Penguins in Game 3 of the NHL Eastern Conference final. "No, no, definitely not," Sens winger Mike Hoffman said after the 5-1 trouncing of the defending champs on Wednesday night. "I would've said before the game it was going to be a one-goal game." Six more and the 2007 record of 51 will fall, which seems likely given that both conference finals still have much to be decided with the entire Stanley Cup final lying ahead after that. "I think just throughout the league it's so tight now," Clarke MacArthur, another Sens winger, said. "Even the best team. You look at Pittsburgh — they've got all-stars, but all the games are just [close]." Game 3 result notwithstanding, no team has played more close hockey in these playoffs than the Sens. Eleven of their 15 games have been decided by a goal with eight resulting in wins (8-3-0). It's not an accident either. The Sens play an extremely defensive brand of hockey designed by head coach Guy Boucher, who instilled such a mindset when he took over as head coach last May. Boucher's group was just above average with 40 games decided by a goal during the regular season. Detroit led the league with 45. "There's so many good players nowadays that can score very easily or make plays with not much time and space — that's really what we try and focus on in here is to key in on their good guys and not give them odd-man rushes," Hoffman said. The 27-year-old, who had played in only one NHL post-season previously, thought the rush of one-goal games might be the result of teams trying to limit mistakes against high-powered opponents with simple hockey. Playing careless, he said, means, "you're going to get pounded. You give teams odd-man rushes the whole game, they're going to score on a good amount of them." Pittsburgh was the highest scoring team during the regular season, but has mustered only three goals through the first three games against Ottawa. Sidney Crosby, who led the NHL with 44 goals, has only a single goal. "You defend them well," MacArthur said. "It's not like the old days where I don't want to say they didn't key on the top players, but you're keying on the top players now. You're literally building your shift around keeping them off the scoreboard. I'd hate to be one of the top guys." MacArthur wondered if increased speed (and fewer enforcer types) across the league made for more even competition. "There's just no bad skaters really anymore," he said. "They're used to be five, six guys on each team where you're like, 'That guy can't really move out here.' He's more of a shutdown guy or crash-and-bang [type]. Everyone can skate now. Every D pairing. Every guy can move. That's kind of what I notice." Stellar goaltending might also be helping. Collective save percentage so far in these playoffs is .921 heading into Thursday's play, trumping the .917 mark of last season. Winning the game's top prize inevitably means winning close games and it's perhaps not surprising that the team with the most one-goal wins has taken the last four Cups, including Pittsburgh with eight in 2016. Ottawa is the current leader. "It's so tight," Predators head coach Peter Laviolette said after a one-goal win over Anaheim earlier this week. "The scores at this time of the year generally are fairly low. And you wonder if 1-0 is going to do it for the night." The Ducks won 12 games by a goal when the current record of 51 was set, including three of four against the Sens in the Stanley Cup final. Frequency of one-goal games dropped considerably for a few years after that before rising up once more in recent seasons.